Transform your cash crunched Local Business into Digital Business. 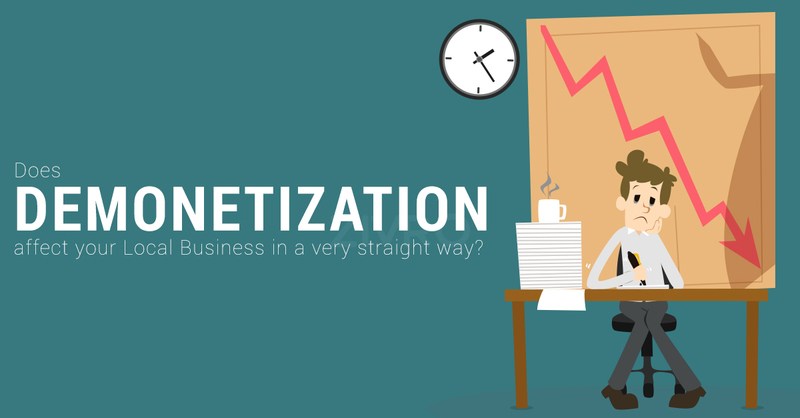 Are you affected by “DEMONETIZATION” in a big way? Know what others are doing. According to the recent survey, there’s 80% drop in sales. Well, this is just half truth. It is true that small traders are the worst affected. But, let’s also take into account lots of potential winners from this government's move. Due to the value of card transactions gone up, the value of mobile banking transactions gone up, the value of internet banking transactions gone up. There is a range of stocks that is getting benefitted from demonetization. But the unbanked and informal economy is hard hit due to their cash-centric way of handling sales. “It’s a GOOD MOVE,” says BIG BROTHERS who are celebrating their grand success. There are lot many celebrating their rise in income while Local businesses still blame the government for this hardship compiled on them. Why is it only Local Businesses who can feel this heat but not the BIG NON-LOCAL business? Amit Agarwal said, Amazon’s man of INDIA. Reasons why Local Businesses are losing out their customers to these Non-Local ones. When people have less cash in their hands, the probability of searching for a local business and doing a transaction also decreases. People prefer online lookups for its ease of use and other choices given at the time of payment. Local businesses are watching losing them. What happens when Local Businesses allow their customers to purchase in a cashless way with easier processes, transparent systems. An amount of cash available to people to spend is dropped to nearly zero. This is not the first time happening neither this would be the last. If local businesses carry on their same traditional ways of running their businesses, they can’t survive in the competition. With their Business digitized and proper use of technology, local businesses can look forward to benefiting with this situation. But how do we define PROPER USE OF TECHNOLOGY? There are various options available to the local business to get over this cash crunch. You can just buy out a card swiping machine. But do you really think that it would work out? Well, there are lot many examples to prove this wrong. “You need an efficient online presence”. Let’s look at how this would benefit your business. Local Business can be your greatest boon if you treat it in a right way. Even your local customers are online. If you’re not found on google, they might not consider you. Having an online presence will build the authority of your business and hence sales. There’s surely a community supporting you. They’re your loyal customers, they shop from you regularly. An online presence serves as a notice board for inviting them to your business events which prove them that you’re not stale. In turn, this results in a better relationship and hence free branding too. Customers find you more reliable than just NON-Local ones because you stay next door or somewhere nearby. They know you personally. Imagine when this reliability is combined with the ease of buying from your shop online. They’ll never have a second thought to go NON-Local. You make fresh, you serve fresh. But what’s the point if you just stay hidden off a street. How do they know what’s going on in your kitchen today? Your customers are looking for fresh kinds of stuff, not the stale ones, so you have all the luck on your side. Be available when they need you. You’re Cost effective. Make it clear! How many times do you feel that your products are lot more cost efficient than your competitive ones? A lot many times isn’t it? Make this clear to your customers too. Your website serves as a transparent channel between you and your customers to communicate everything and anything. You might have stocked a lot many products which are sparingly seen by your customers who desperately want to buy them. Showcase them in the right place for the right kind of people to see. When people can view what lies in your shop through their devices, you get more sales out of it. You’ve have got Personal connections with customers. Arrange a proper Follow-ups. If you don’t take care of your customer your NON-Local counterpart business will take care off. Make sure that you send out discounts, coupons and remind them what you’re up to. This can be easily done with your online presence with little budgets. Got some art pieces done by your close relatives that seem to be quite interesting? Make it visible online to grab the attention of customers who finds it interesting too. Make your Local shop visible on google maps because this is the place where people really find you. People around the world visit places just to find out the essence of local specialties. If you cover up yourself by being just offline, there is no way they get to know about you. You work hard enough to be open most of the time. Having no online presence results in close board outside your shop for most of your potential customers. Being online means being 24/7 open and that’s truly a good sign, isn’t it? We are invested in your business. Our focus today is simply you- LOCAL BUSINESS OWNERS! THE MAKERS OF THIS ECONOMY. Zivro is an all in one Platform, fully hosted solution that enables anyone to create a dynamic website for any product, service or industry. It is the cheapest and quickest way to go online addressing all the technical & marketing aspects. Zivro can be used to build an own online marketplace and create a community too. We are here to provide hope for you. Visit us at www.zivro.com.